If you have a question about horse care, facilities, horse behavior or training, perhaps your questions has already been asked and answered on my Horse Information Roundup. OR you can use the Horsekeeping search tool at the top of the page to type in a word or phrase and that will create a list of articles that contain that subject. and here is a place where you can look for books by category – the Book Barn. Your farrier is the best person to ask this question and to find a solution. 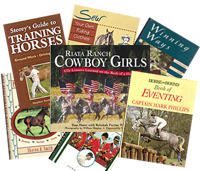 New and Used Horse Books – from Cherry Hill’s Library — Buy One and Get TWO FREE !! More books from my library being added to the BOG2F page ! What Cherry Hill horse books are available as ebooks? Horse Nutrition - Can a Horse Eat Too Much Salt? Happy Trails until we meet again……..